Home coffee brewing is a thing now thanks to the creative minds out there coming up with all these innovative ideas of simple yet very effective manual espresso makers. Earlier we mentioned in some ways quite similar great handheld espresso makers but today we will focus on the two espresso makers that you have probably come across, Rok and Flair, but we aim to point out their differences, we will also add their reviews and comparison table. We will start off by reviewing each then after point out the main points that set them apart. The good thing about manual espresso makers (like portable espresso makers) is that you can take them with you to whatever destination and continue having your espresso just the way you like it. With them you will always be able to enjoy your favorite espresso wherever you are. This espresso maker was launched in 2012 and the only reason that it has survived through the years is that it does just what ROK Kitchen Tools says it will. This manual espresso maker features an extremely sturdy aluminum body that’s also lightweight, and this makes it ideal for use either at home or when on the road. It is very durable, and all you need to get a creamy cup of coffee is your grounds, hot water and a set of strong hands because it has two arms. If you haven’t used a manual espresso maker in this design, it might feel tough when using it for the first time, but with time it becomes easy. You will need to preheat the portafilter before filling it with the coffee grounds and attaching it to the machine’s main body. Once attached, add hot water to the reservoir then lift the two arms to allow the hot water to pre-infuse the coffee grounds for like five seconds before forcefully pressing them down to get rich espresso in your cup. The pressing down of the arms is known as the pressurized stage, and it generates roughly 5-10 bars of pressure while taking 20-30 seconds. If need be, go for a second lift then press. This espresso maker’s portafilter holds up to 7g-8g coffee grounds. As such, it can only pull single, and with 5-10 bars of pressure, you get true espresso shots. 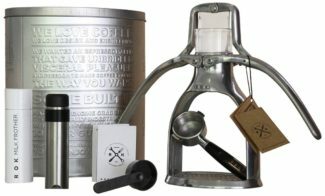 The ROK espresso maker has just two parts, the main body, and the plunger. You don’t really need to take any parts apart when making your espresso, so the process is pretty quick. The Flair espresso maker features a very sturdy aluminum body and a stainless steel brewing head. There is a high chance that you have not used an espresso maker with a similar or close design with the Flair espresso maker, and this means that you will take some time and work to adjust. Aesthetically, the Flair espresso maker features all sleek curves and looks and feels very sturdy. I like that this espresso maker comes with a compact carrying case with molded foam for protection on the inside. The case is really helpful when you need to take the espresso maker on the road with you, but getting it to fit in there can be tricky so always have the diagram instructions manual with you. The design goes together perfectly, and you won’t need directions for that. It also packs up flat once you’re done making your espresso. There is a slot where you slip its upright back support then lock it effortlessly, and you will be good to go. The Flair espresso maker has six main parts which include the portafilter, the water chamber, piston, a dual measuring tamper, plus a funnel cone that you use to get the coffee ground in the portafilter. It also has a red silicone piece that you hold when the water chamber is hot to ensure that you don’t get burnt. When packing it, you will need to position each of these parts in the right positions for it to fit in the carrying case and this is why you need you diagram manual. Now, it’s worth mentioning that when it comes down to the brewing process, ROK and Flair espresso makers are very similar. However, there are a few features that set them apart. 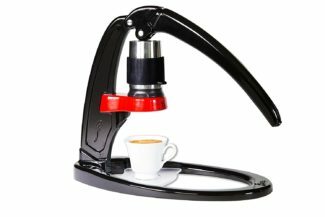 The ROK espresso maker has two side arms, but the Flair has just one long arm. As such, one might be more comfortable than the other to some people. The two espresso makers will give you true espresso shots, no doubt, but the Flair, with 16 bars of pressure gives a better guarantee compared to Rok’s 5-10 bars of pressure. This means that with Flair, you won’t be worried about not reaching the recommended level of pressure for a true shot and you won’t need to lift and press twice. The Flair espresso maker uses between 16 and 22 grams of coffee grounds to give 50ml true espresso shot. On the other hand, the ROk espresso maker between 7 and 8 grams of coffee grounds to give just one shot of true espresso. So you can choose one over the other based on your needs. The Flair espresso maker is good with heat retention compared to the Rok, and this is because the Rok features a plastic plunger and as you already know, the plastic material, despite being BPA free, is not the best with heat retention. Flair has no plastic material. The Flair is obviously easy to clean as it features a detachable brewing head. The ROK, despite having just two parts takes a bit more time to clean especially because of the bottom area and it also requires more water to get clean. The Flair espresso maker measures 10.2 x 4 x 13.7 inches. It weighs 4.9 pounds, and it comes with a great carrying case, and it packs down very well. The ROK espresso maker measures 12.2 x 8 x 10.5 inches. It weighs 3.46 pounds, and it comes with storage tin. They both do not come with tampers, so you have to purchase them separately. These two manual espresso makers are super-durable as they feature stainless steel and premium grade construction and they make great espresso shots. However, one design might suit your needs better and with the knowledge about their differences, making a choice will be easier.